I assume that the title requires no explanation. Shadows have long had a somewhat uncertain ontological status, dating back to Plato’s cave allegory, and probably before. There’s no doubt that shadows are real — we can see them with our own eyes, after all — but good luck trying to touch one, or pack it up and take it home with you. Sometimes, too, it’s not the shadow that moves. These images are great fun (trying to catch shadows could be an amusing game for small children), but then you realize that most of these tape outlines will hardly outlast the shadows they are capturing, whether because they will be worn away, or deteriorate in the weather, or be removed by diligent city workers. Thus the need to photograph the outlines after they are complete. 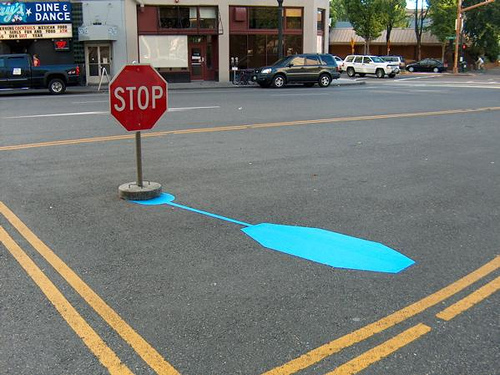 Is the blue tape outline the artwork, or is the photograph of the outline the work of art? Both, surely, but how long will a digital photograph last? 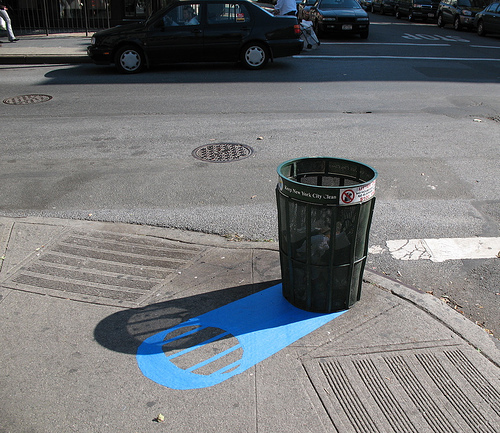 Forever, we hope, but in the grand scheme of things, those digital files may be as fleeting as the blue tape, which is as fleeting as the shadows themselves. I was particularly interested in these works because my friend Pablo Manga, an artist here in Oakland, also works with tape, but with dramatically different results. You might think that tape would be a limiting medium, but Pablo’s works achieve very different effects depending on the kind of tape and the colors he chooses. Even variations in the manufacturing quality of the tape can create some fascinating effects. And that’s all before any decisions about how to place the tape, which produce an entirely different set of possibilities. If you can make at least one person stop, smile, and point, then that’s an artistic success as far as I’m concerned. The Swarm Gallery exhibition, at 560 2nd Street near Jack London Square, will last from February 20th to March 29th. Among the many objects whose shadows Penrod has tried to snare are orange traffic cones, and his Swarm installation will involve traffic cones as well. You can also find more work on Penrod’s blog or his Flickr portfolio (there’s more than just the tape outlines, even though that’s all I’ve mentioned here.) Good stuff, I think, and I definitely plan to check it out in person when the show opens. This entry was posted on Wednesday, February 4th, 2009 at 4:33 pm	and is filed under Art, Oakland. You can follow any responses to this entry through the RSS 2.0 feed. You can skip to the end and leave a response. Pinging is currently not allowed. Cool Pictures but your post sent me up to the liquor store for a bottle of Pernod.I kept looking at his name and thinking I haven’t had a Pernod in a good while so off I went. jabel: Now there’s a comment I didn’t expect to get. What can I say? I’m glad I could provide some inspiration, even if it’s not the kind of inspiration I had in mind. That’s pretty fantastic. And very cool to see Pablo is an artist, and an interesting one at that. Thanks for hte postin’! 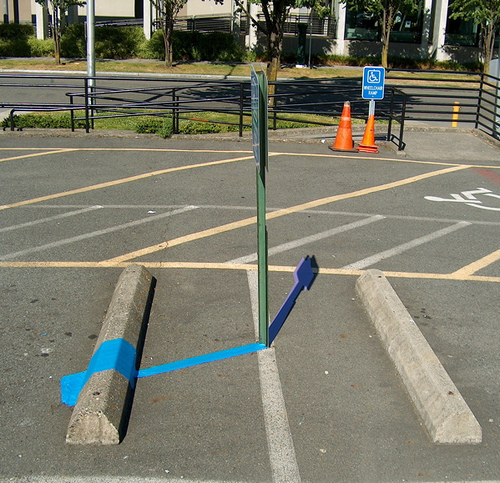 I’ve just looked at Joe Penrod’s blue tape installations again. Cheerier, though more ephemeral, than that naval base and your newest pictures of it! It is the absence of almost any kind of vegetation and the neglected buildings that make desolation concrete for me. Even the chapel that does not forbid entrance has prison-like windows. Are those places inhabited? I liked the cranes across the estuary, looking like twenty-first century dinosaurs. They must have evolved from them. I only found Joe Penrod’s comments on your blog when I googled Fragmentary Evidence today as I turned away in total disgust from today’s various news items, filled with — you may have guessed it — fragmentary evidence. Ruth: Penrod indicated by email that he liked what I wrote, which was nice to hear. (I would hate to write about someone’s art, then be told that I was missing the point somehow!) I went to see the show, and Penrod’s installation had a pretty different effect in the gallery setting. As for the buildings on the base being inhabited, some of them are and some of them aren’t. I went into that question a bit in a comment on my other post. There is more vegetation on some other parts of the base, especially in the area where the officers’ homes were located (that part of the base is still inhabited and the buildings are less interesting, so I I didn’t bother to take any pictures there). DC, I do appreciate what you wrote about my work. I think you understand it well, which is nice. I agree that it is very different in a gallery setting. I see it as an offshoot of the outside work. Since there is no natural shifting source of light (I use a floodlight at night) the focus is more on turning light (or the absence of it) into a physical object. Glad you made it out to the show. 3-28-09. 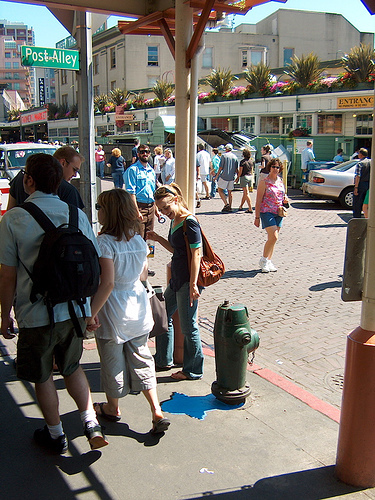 I have just looked again at the girl pointing with gentle amusement at the blue shadow of the fire hydrant. Did you notice that the green street sign in front of her says Post-Alley? I also like the way the color of the sign in the upper right of the first photo matches the color of the tape in the lower left—it creates nice symmetry.